Jury Verdicts - Giometti & Mereness, P.C. Mr. Giometti and Mr. Bellamy defended IDS Property and Casualty Insurance Company against claims for UIM benefits, and common law and statutory bad faith, resulting from IDS’ denial of Mr. Stivers’ UIM claim following a September 14, 2012 accident. Mr. Stivers allegedly suffered contusions to the knees, shins, and chest; concussion with post-traumatic visual sequelae; cervical and lumbar strain/sprain; and a herniated disc at L5-S1 with retrolisthesis and instability. IDS retained Dr. Charles E. Bain, who determined that Mr. Stivers did not sustain a concussion as a result of the accident and did not sustain any significant lumbar injury. At trial, Mr. Stivers claimed past and future economic damages in excess of $340,000. Following a four-day trial, the jury found that Mr. Stivers’ damages did not exceed the underlying tortfeasor’s policy limit and that he was not entitled to UIM benefits, and the Court entered judgment in favor of IDS on all of Mr. Stivers’ claims. Mr. Giometti defended The German Car Shoppe against claims for negligence arising out of a motor vehicle incident. Tuteur allegedly suffered an aggravation of pre-existing degenerative disc disease in her neck and developed lower back pain and sciatica. Tuteur claimed that Dustin Lovett, an employee of the German Car Shoppe, negligently failed to put fluid in the differential during a repair of an oil leak on her vehicle, which caused it to violently jolt twice before coming to a stop. Tuteur alleged that as a result of the injuries she suffered in the accident, she was permanently injured and had to quit her job at Loro Piana, a high-end clothing store in Cherry Creek. The German Car Shoppe and Mr. Lovett denied that Mr. Lovett negligently repaired Tuteur’s vehicle, as the repair work did not require doing anything to the differential except moving it out of the way. Tuteur requested the jury to award damages in a range between $2,914,000 and $4,371,000. After a four-day jury trial, the jury returned a verdict in favor of The German Car Shoppe and Mr. Lovett, finding that Tuteur had no injuries, damages, or losses; that Mr. Lovett was not negligent; and that Mr. Lovett’s negligence, if any, was not a cause of Tuteur’s claimed injuries. Mr. Giometti and Mr. Mereness defended Auto-Owners Insurance Company against claims for breach of contract and bad faith. Dillon allegedly suffered a mild traumatic brain injury, causing permanent cognitive impairment. The accident was purportedly caused by the negligence of two drivers, each of whom had $50,000 in liability coverage. Auto-Owners retained a physician to conduct a record review and determined that Dillon did not suffer an mTBI in the accident, and Auto-Owners concluded that Dillon was not entitled to recover UIM benefits because her recoverable damages did not exceed the available liability insurance benefits of $100,000. After an eight-day jury trial, the jury returned a verdict in favor of Auto-Owners, and the court entered judgment for Auto-Owners and against Dillon, along with judgment for costs. Mr. Giometti defended Owners Insurance Company as defendant-intervenor in a UIM case arising out of an accident on March 24, 2015. Plaintiff had UM/UIM coverage under a policy issued by Owners. The Plaintiff’s vehicle struck the side of a truck and trailer driven by Gabriel Mattice at an intersection in Weld County. The plaintiff alleged that Mattice had failed to stop for a stop sign and was pulling into the intersection in front of her, causing her to swerve to avoid a collision, but resulting in her vehicle colliding with the truck and trailer. Mattice asserted he had stopped and had moved forward slightly but was behind the stop line when the accident occurred. Mattice was insured for liability under a policy with limits of $1,000,000, but plaintiff claimed damages in excess of $1.3M, possibly triggering a UIM claim. The jury returned a defense verdict, thereby triggering no UIM coverage. The case subsequently settled without payment of any UIM benefits by Owners. Trial Victory - Saved Client $575,873: Colorado Hospitality Services, Inc. d/b/a Days Inn Englewood v. Owners Insurance Co.
Mr. Giometti defended Owners Insurance Company against claims for breach of insurance contract and violation of C.R.S. §§ 10-3-1115 & -1116. Colorado Hospitality Services, Inc. d/b/a Days Inn Englewood (“Days Inn”) alleged that a hotel on its property suffered damage from a hail storm in the amount of $191,944.30. In addition, Days Inn sought double damages, attorneys’ fees, and costs. Yet, the jury found for Owners on all claims. Favorable Verdict - Saved Client $2,946,242: Colorado Hospitality Services, Inc. d/b/a Peoria Hospitality, LLC v. Owners Insurance Co.
Mr. Giometti defended Owners Insurance Company (“Owners”) against claims for breach of insurance contract and violation of C.R.S. §§ 10-3-1115 & -1116. Colorado Hospitality services, Inc. d/b/a Peoria Hospitality, LLC (“Peoria”) alleged that a hotel on its property incurred damage due to a hail storm. Prior to trial, the claim was submitted to the appraisal process, which yielded an appraisal award in favor of Peoria in the amount of $903,986.90. Through discovery, Mr. Giometti learned that Peoria’s appraiser had a contingent fee term in his appraisal contract that rendered him partial as a matter of law. Owners moved to vacate the petition, and the petition action was ultimately consolidated with the underlying litigation. The Court granted summary judgment in favor of Owners, vacating the appraisal award and the remaining issues went to trial. Judgment was entered for the plaintiff in the amount of $42,094.17 ($70,781.70 less $5,000 deductible and $23,777.53 previously paid by Owners) for the breach of contract claim and $84,188.34 for the claim for unreasonable delay or denial of benefits. Peoria sought an award of attorneys’ fees in the amount of $333,040 and costs in the amount of $27,524.54; but the Court reduced the request, awarding $154,847.50 in attorneys’ fees and $19,828.55 in costs. Trial Victory - Saved Client $150,000: Mary Marshall v. Parker Montgomery, James Montgomery; Max Rosenstock & Company, MSG, Inc., James A. Lorenzen, and Cornerstone Apartment Services, Inc.
Mr. Giometti defended Cornerstone Apartment Services, Inc., Max Rosenstock & Company, MSG Investments, Inc., and James A. Lorenzen (the “Cornerstone Defendants”) against claims under Colorado’s Premises Liability Statute, C.R.S. § 13-21-115. Plaintiff alleged that she suffered personal injuries as a result of a fire that broke out at her apartment complex, which was owned and/or operated by the Cornerstone Defendants. She sought economic damages in the amount of $96,495.68, as well as non-economic and physical impairment damages. The Cornerstone Defendants made a statutory offer of settlement to Plaintiff in the amount of $50,000. The jury returned a verdict in favor of the Cornerstone Defendants and against Plaintiff. Plaintiff recovered against Parker Montgomery. The Firm defended Colorado Custom Wood Floors, Inc. (“CCWF”) against claims for negligence, and breaches of express and implied warranties. The claims against CCWF were brought by Dan and Sue Steffy (the ‘Steffys”), and the Steffys sought $190,827.32 in economic damages. CCWF made two statutory offers of settlement to the Steffys, the first in the amount of $5,000 and the second in the amount of $10,000. The jury returned a verdict in favor of CCWF on the Steffys’ breach of express warranty claim (the breach of implied warranty claim had been withdrawn). The jury found in favor of the Steffys on their claim for negligence, but after reduction for comparative negligence and third-party negligence, judgment entered in the amount of $26,016.80, together with post-judgment interest. The Firm represented IDS as defendant-intervenor in a personal injury auto collision case. IDS was the uninsured/underinsured motorist carrier. Plaintiff’s final demand to IDS was $50,000 prior to trial. The jury returned a verdict for plaintiff in the amount of $295.75 for economic losses and $888.25 in the amount of non-economic losses. In addition to the personal injury claims asserted in this state court case, Kheim Le initiated bad faith litigation against IDS based upon IDS’s “denial” of his UIM claim, which was removed to the U.S. Dist. Ct. for the Dist. of Colorado. Ultimately, the bad faith litigation was dismissed following the verdict in the state court action because Plaintiff was not entitled to collect UIM benefits. The Firm defended the driver and his employer in a personal injury accident case. Plaintiff sought damages against a corporate employer – Chess Moves – and its driver – Ronald Stevens – (“Defendants”) for personal injuries arising from a two-vehicle accident. Plaintiff’s final demand before trial was $325,000. The Defendants made a statutory offer of settlement in the amount of $20,000. In anticipation of trial, Plaintiff sought $116,715.89 in economic damages, future medical expenses, and non-economic damages. The jury rendered a defense verdict on liability. The Court awarded costs in favor of Defendants and against Plaintiff in the amount of $9,506.31. Mr. Giometti and Mr. Mereness defended Auto-Owners Insurance Company (“Auto-Owners”) against claims for breach of contract, bad faith breach of insurance contract, and violation of C.R.S. §§ 10-3-1115 & -1116. Plaintiff’s claims arose from two separate losses: one in 2009 and another in 2011. Plaintiff initially sought damages in excess of $1,000,000, and made a pre-trial settlement offer in the amount of $750,000 and Auto-Owners made a pre-trial settlement offer in the amount of $250,000. With respect to the 2009 loss, judgment was entered in favor of Auto-Owners on Plaintiff’s breach of contract claim and bad faith breach of insurance contract. In addition, judgment entered in favor of Auto-Owners on Plaintiff’s bad faith breach of insurance contract arising from the 2011 loss. Judgment entered in favor of Plaintiff on his breach of contract claim arising from the 2011 loss; on his claim for unreasonable denial of insurance benefits arising from the 2009 claim; and his claim for unreasonable denial of insurance benefits arising from the 2011 claim. Ultimately, Plaintiff was awarded $260,001.00 plus interest, costs, and attorney’s fees. Favorable Verdict- Saved Client $11,951,125: Delberta “Susi” Gida and John Gida v. Chris D. Guadagnoli and Safe Site, Inc.
Mr. Giometti represented the corporate employer – Safe Site, Inc. – and its driver – Chris Guadagnoli – (the “Defendants”) against claims for negligence, negligence per se, loss of consortium, negligent hiring and supervision, and respondeat superior. Mr. Guadagnoli admitted liability for the accident, but the Defendants disputed the extent and/or validity of plaintiff’s damages, including plaintiff’s claim of a mild traumatic brain injury. Plaintiffs made a final pre-trial offer in the amount of $5,000,000. The Defendants made two statutory offers of settlement: the first in the amount of $595,000 to Delberta Gida and $5,000 to John Gida and the second in the amount of $800,000 to Delberta Gida. At the conclusion of the trial, Plaintiffs appealed to the jury for an award of $12,000,000. The jury awarded $5,000 for non-economic losses, $43,875 for economic losses, and $0 for physical impairment on Delberta Gida’s claims; however, the jury found in favor of the Defendants on John Gida’s loss of consortium claim. Ultimately, judgment entered in the amount of $387,315.37 in favor of the Defendants, which reflected the Defendants’ costs. Plaintiffs appealed the case, but the Defendants prevailed on appeal. The Firm defendant Ms. Holmquist in an action for personal injuries and property damages. Plaintiff alleged claims for negligence, negligence per se, strict liability, and violation of C.R.S. § 13-21-124, which arose from an altercation between Plaintiff’s dog and Ms. Holmquist’s dog. Plaintiff’s final demand before trial was $45,000 for medical and veterinary expenses, as well as non-economic damages. Ms. Holmquist made two statutory offers of settlement: the first in the amount of $25,000 and the second in the amount of $35,000. The jury awarded the plaintiff $18,190 and assigned the plaintiff 20% negligence. Defendant was awarded costs of $6,790.69, and the final judgment entered for the plaintiff was $13,140.89. Mr. Giometti defended Auto-Owners Insurance Company (“Auto-Owners”) in an action for declaratory relief regarding coverage for purported construction defects and water damage. The claim arose when pipes at plaintiffs’ log house froze and caused a water leak. Plaintiffs submitted a claim to their homeowners’ insurance company, Auto-Owners, who paid for repairs to the home but noted construction defects in the home. The jury answered a special interrogatory, finding that the structural deficiencies in plaintiffs’ home were not caused by the water leak. As a result, judgment was entered in favor of Auto-Owners on the declaratory judgment claim. Mr. Giometti defended Owners Insurance Company (“Owners”) against claims for underinsured motorist benefits and damages for delay or denial of benefits. Causation was disputed, and Owners questioned the low-impact nature of the collision as well as possible pre-existing injuries. The jury awarded $1,382,000 to Plaintiff for non-economic, economic, and physical impairment damages. This was reduced to $750,000 (policy limits) then doubled based upon a determination of an unreasonable denial and/or delay of benefits. Owners appealed the verdict and the 10th Circuit affirmed. Mr. Giometti represented Owners Insurance Company (“Owners”) for a UIM claim as well as claims of common law breach of duty of good faith and fair dealing and statutory bad faith breach of contract in a personal injury auto collision case. Plaintiff made a pre-trial settlement demand in the amount of $425,000. On the UIM claim, the jury awarded Plaintiff $530,247.19 for underinsured motorist benefits. The jury found for Owners on the common law breach of duty of good faith and fair dealing. The jury found for Plaintiff on the statutory bad faith claim. On November 14, 2012, Judge Williams vacated the verdict and granted a new trial due to the conduct of Plaintiff’s counsel. Prior to the second trial in this matter, the parties reached a settlement. The Firm represented Ms. Wasinger in a personal injury case involving a motorist and bicyclist, which turned on the question as to who had the right of way. Plaintiff claimed lumbar spine injuries arising from a collapsed disc at L4-L5. Plaintiff’s medical expenses were $17,400. The jury found for Ms. Wasinger, attributing 88% negligence to the plaintiff and only 12% negligence to Ms. Wasinger. Ms. Wasinger was awarded costs of $38,621.28. Mr. Giometti represented the defendant, Ms. Wilcox, in a personal injury case arising from a motor vehicle collision. In a ten-car pile-up on I-25, Plaintiff alleged that Ms. Wilcox was negligent and lost control of her vehicle, thereby causing the collision. This entry arises from a third trial, after the Court of Appeals remanded the case regarding the issue of whether Plaintiff was a legal resident entitled to work in the U.S. Plaintiff eventually admitted that he was not a legal resident of the U.S., and he agreed to withdraw any claim for lost income or earning capacity. Ultimately, judgment was entered in favor of Ms. Wilcox based on the jury finding that Ms. Wilcox was not negligent and did not cause the accident. Trial Victory - Saved Client $60,000: Shawna Lawley v. Esurance, Inc.
Mr. Giometti defended Esurance, Inc. (“Esurance”) against claims for bad faith breach of an insurance contract and violation of C.R.S. §§ 10-3-1115 & -1116, arising out of the theft of a vehicle. Plaintiff’s vehicle was stolen and later recovered after having suffered damage. Plaintiff alleged Esurance failed to investigate the claim and unreasonably delayed payment of her claim. The jury found for Esurance on Plaintiff’s claims, and judgment entered in Esurance’s favor. The jury found that Plaintiff committed fraud in the submission of her claim. Mr. Giometti defended Chase Kavcak, a 14-year-old who, on March 20, 2009, collided with Plaintiff who was skiing at Copper Mountain Ski Resort. Plaintiff sustained a compound fracture of the tibia/fibula of the left leg, requiring surgery and rehabilitation. Plaintiff made a settlement demand in the amount of $198,000. Defendant made a statutory offer of settlement in the amount of $60,000. The jury found in favor of Plaintiff and awarded damages of $75,000 ($10,000 in non-economic damages, $40,000 in economic damages, and $25,000 for physical impairment). Mr. Giometti defended Auto-Owners Insurance Company against claims for payment of UIM benefits, breach of contract, bad faith breach of contract, and violation of the Colorado Consumer Protection Act (CCPA) in a personal injury auto collision case. Plaintiff alleged damages for the UIM policy coverage amount of $125,000. The jury determined plaintiff’s total damages were $60,000, offset by $25,000 already received from the at-fault driver’s insurer. The Court granted summary judgment in favor of Auto-Owners on the breach of contract, bad faith, and CCPA claims. Mr. Giometti represented Robson Contracting against a negligence claim asserted in a construction defect case. The jury found against the plaintiffs on the claims for the defendants L.T. Builders, Robson Contracting, and Carousel Pools. Mr. Giometti defended Owners Insurance Company for claims arising from a building fire. Plaintiff alleged breach of contract and insurance bad faith claims against Owners. Jamro subleased the building from Econo Lube, which was required to have insurance for the building as part of the lease terms. Jamro’s policy with Owners did not include coverage for physical damage to the building itself. At trial, Jamro claimed an additional $133,000 in business interruption losses not already paid by Owners and $913,000 in additional economic damages. The jury returned a verdict in favor of Owners on all claims, including breach of contract and bad faith. Favorable Verdict - Saved Client $392,538: Helen Anderson v. Aloysius J. Schlosser and Milestone CM, Inc.
Mr. Giometti represented the defendants in a personal injury auto collision case. Plaintiff’s stipulated past medical bills were $142,828. Plaintiff also alleged a past wage loss of $54,726 and future wage loss of $382,262. The jury awarded $74,085 to plaintiff but attributed 40% negligence to the plaintiff. The net verdict for the plaintiff was $44,450.40 plus statutory interest. Mr. Giometti defended the bowling center against a plaintiff’s premises liability claim. The plaintiff claimed the approaches on the lanes were very sticky and applied baby powder to her shoe to help her slide. She claimed that one of her teammates reported the sticky conditions to the bowling center, but that they failed to properly clean the approaches, causing her foot to stick, resulting in her fall and breaking her left ankle. The defendants’ position was that the plaintiff’s application of the baby powder created dangerously slippery conditions, causing her to fall. Before the trial, the plaintiff underwent 12 surgeries and incurred medical expenses of approximately $212,000; she stated she would require additional surgery and procedures. The plaintiff claimed damages for past and future medical expenses exceeding $400,000; damages of physical impairment of $400,000; and non-economic damages of more than $200,000. The defendants denied they were liable under the premises liability statute and asserted that the plaintiff’s injuries and damages were caused by her own comparative negligence. The jury rendered a verdict that both parties were at fault. The jury found that the plaintiff’s non-economic damages were zero; her economic damages were $232,000; and damages for physical impairment were zero. The jury attributed 75% of the fault to the plaintiff and 25% to the defendants. Accordingly, the judgement was entered in favor of the defendants. Mr. Giometti represented the defendant in a personal injury, auto collision case. The defendant was attempting to make a left hand turn in front of the plaintiff who was traveling in the opposite direction. The plaintiff alleged that the defendant took the right-of-way, and the plaintiff’s vehicle struck the defendant’s vehicle as the defendant tried to complete the turn. The defendant said the oncoming traffic was stopped in two of the three lanes. The defendant asserted that the plaintiff was comparatively negligent. The plaintiff asserted that she sustained a traumatic brain injury in the accident’ which disabled her from performing her job a substitute teacher. The jury found in favor of the plaintiff, awarding damages of $68,592.73 (gross); 30% negligence charged to the plaintiff; 70% charged to the defendant. The plaintiff’s final demand before trial was $100,000. Mr. Giometti represented the plaintiff, a sergeant employed by the Denver Police Department. The defendants were the mother and sister of the plaintiff’s husband, who died of cancer. The plaintiff alleged that the defendants maliciously prosecuted two claims in the Denver Probate Court. In addition, in December 2006, defendants published defamatory letters to eleven private companies and governmental entities accusing the plaintiff of criminal conduct. On May 14, 2007, the defendants published defamatory letters to two oil companies in Texas. The plaintiff asserted five claims of defamation against each defendant for the publication of the defamatory letters in December 2006 and May 2007. In June 2008, Merry Gayle Vickery, acting through a private investigator known as “The Raven,” published four defamatory CDs to four different governmental and private agencies. These CDs contained files accusing the plaintiff of criminal activity. The plaintiff then amended her complaint to add four defamation claims against the defendants and to seek punitive damages. The jury returned a verdict in favor of the plaintiff on one of her two malicious prosecution claims and awarded economic, non-economic and punitive damages. The jury also returned a verdict in favor of the plaintiff on all nine of her defamation claims against Merry Gayle Vickery and on five of her defamation claims against Evelyn Trumble. The jury’s combined awards of compensatory and punitive damages against both defendants exceeded $400,000. 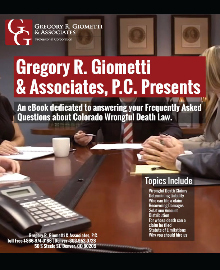 Mr. Giometti represented the defendant in a case arising out of a ten car accident on I-25 in Denver during a snowstorm. After it slowed to about 7 miles per hour, the defendant’s vehicle rotated approximately 240 degrees and slid into an adjacent lane, where it was hit by an RTD bus. The plaintiff claimed that after the bus hit the defendant’s vehicle, the bus hit his vehicle, causing him to suffer substantial injuries, including an injury to his left arm, which required surgery. The plaintiff claimed he developed RSD. The defendant denied liability, but, over defendant’s objection, the court gave a negligence per se instruction based upon Denver Municipal Code § 54-158. The plaintiff argued that under this code section, defendant was negligent per se because she “lost control” of her vehicle. The jury returned a verdict in favor of the plaintiff for $80,444.50. Plaintiff’s lowest settlement demand was $225,000. The case is on appeal. Brett Wallman v. Neils Lunceford, Inc.
Mr. Giometti represented the defendant in a premises liability action. The plaintiff, a FedEx driver, was injured on 4/20/05 after entering the defendant’s office. He was looking at a hand-held computer and stepped into a hole in the floor where an access cover had been removed. He alleged he injured his right elbow and right shoulder, for which he had surgery in the fall of 2007. He also alleged he lost his FedEx business because of these injuries. The plaintiff had medical expenses of over $60,000. Based on the court of appeals’ ruling in the Martin case, the court refused to instruct the jury on comparative negligence. The jury returned a verdict in favor of the plaintiff for $89,494. The plaintiff’s lowest settlement demand was $180,000. Mr. Giometti represented Amica in a DJA arising out of a fire that occurred on 01/25/07. Amica alleged the fire was intentionally started by the homeowner, John Haverland. Haverland and his ex-wife filed counterclaims for breach of contract and bad faith, which were bifurcated. The jury rendered a verdict that the fire was set by John Haverland with the intent to cause a loss. Amica filed a MSJ on all remaining claims, which the court granted. The court later entered a declaratory judgment in favor of Amica on its subrogation claims, but all remaining claims between the parties have been settled. Mr. Giometti defended insurer in action for breach of contract and bad faith by homeowner, who presented claims for property damage and theft after police discovered a meth lab run by her ex-husband in the basement of her house. Verdict was for the insurer on both claims for breach of contract, but in favor of insured on bad faith claim. Insurer filed motion for new trial and JNOV on bad faith claim. Clifford Lott v. Auto-Owners Ins. Co.
Mr. Giometti defended insurer in action for breach of contract and bad faith arising from insurer’s denial of insured’s claim for enhanced PIP benefits. Before trial, the court granted MSJ in favor of insurer on the bad faith claim. The jury determined that the insurer had made a proper offer of enhanced PIP coverage and judgment entered in favor of insurer. Insured appealed. Mr. Giometti defended motorist who made a left turn in front of vehicle driven by plaintiffs, an elderly couple. Jury found that one-third of fault for accident rested with plaintiff driver. The jury awarded damages of $10,000 for wife and $14,574 for husband, which were reduced by one-third. Judgment in favor of wife was less than defendant’s statutory offer of settlement. Mr. Giometti defended motorist who rear-ended plantiff’s vehicle, causing minimal damage. Plaintiff claimed she developed intractable migraine headaches, and husband sought damages for his own injuries and loss of consortium. Jury rendered a verdict in favor of the defendant, finding that plaintiffs failed to satisfy the PIP threshold requirement. Jasmine, Inc., Scotcom Development, LLC and Scott Swanson v. Employer’s Fire Ins. Co.
Mr. Giometti defended insurer from claims of breach of contract, bad faith and violation of the Colorado Consumer Protection Act after insurer denied claim for fire damage to restaurant on the ground that fire was started by the insured. Jury’s verdict was in favor of insured on breach of contract claim. Jury found bad faith but awarded insured $0 damages. Trial court dismissed CCPA claim as a matter of law. Mr. Giometti defended motorist, whose vehicle struck 12- year-old boy in intersection. Boy suffered severe brain injury and claimed economic losses in excess of $10M. Defendant asserted she did not cause accident because boy ran into intersection against red light. Jury rendered verdict in favor of defendant, finding she was negligent, but she did not cause the accident. Richard Lashua and Robben Lashua v. Thomas Gearhart, Jr.
Mr. Giometti defended motorist whose vehicle rear-ended plaintiff’s car, causing minor damage. Plaintiff claimed multiple injuries, including traumatic brain injury, and wife claimed loss of consortium. Jury found in favor of defendant, awarding $0 in damages to plaintiff, and ruling wife did not suffer loss of consortium. Mr. Giometti defended motorist whose vehicle collided with plaintiff’s vehicle in intersection. Plaintiff claimed accident caused traumatic brain injury. Plaintiff also claimed damages for separate accident in which he was hit by an armored car while riding his bicycle. Jury found in favor of defendants regarding both accidents, awarding plaintiff $0 in damages. Joan Kearney v. State Farm Mut. Auto. Ins. Co.
Mr. Giometti defended insurer in lawsuit to recover underinsured motorist benefits. Plaintiff alleged permanent disability from auto accident and claimed she was entitled to recover her UIM policy limit. Jury rendered verdict in favor of insurer, concluding insured was not entitled to recover UIM benefits. Mr. Giometti defended 87-year-old motorist who made left turn in front of plaintiffs’ vehicle. Plaintiffs alleged neck injuries and called economist to testify in support of claim for loss of earning capacity. Both plaintiffs alleged loss of consortium. Jury awarded husband $9,900 and wife $4,800. Judgments in favor of plaintiffs were less than defendant’s statutory offers of settlement. Susan Grossetete Johnson, et al v. State Farm Mut. Auto. Ins. Co.
Mr. Giometti defended insurer in action to recover uninsured motorist benefits. Insured, who had BAC of 0.21, was leaving bar and was struck and killed by hit-and-run motorist. Insured’s wife and children brought claim for UM benefits for insured’s wrongful death. Jury found in favor of plaintiffs, charging 65% of fault to the hit-and-run driver and 35% to the insured. Mr. Giometti defended spa maintenance company against plaintiff’s negligence claim. Plaintiff alleged she was severely burned after getting into hot tub where water temperature exceeded 130 degrees F. Plaintiff alleged defendant’s failure to detect and warn against design flaws in spa system caused spa to overheat. Plaintiff settled her claim against homeowner before trial. Jury’s verdict was in favor of defendant, finding defendant was not negligent and did not cause plaintiff’s injuries. Mr. Giometti defended motorist in plaintiffs’ bodily injury action arising from minor rear-end collision. Jury found in favor of defendant, concluding plaintiffs failed to meet the PIP threshold. Mr. Giometti defended motorist in bodily injury action where defendant admitted liability. Jury awarded plaintiff damages of $25,000. Plaintiff’s lowest settlement demand was $30,000. Mr. Giometti defended motorist in bodily injury action arising from head-on collision. Plaintiff claimed permanent tinnitus in both ears, aggravation of pre-existing low back injury and impairment of earning capacity. Plaintiff sought future medical expenses of $250,000 to $500,000. Jury awarded plaintiff damages of $112,000. Mr. Giometti defended motorist in bodily injury action arising out of a rear-end collision. Plaintiff claimed low back injury and loss of earning capacity in excess of $208,000. Jury found in favor of defendant. Mr. Giometti defended motorist in bodily injury action where plaintiff claimed damages for closed head injury, double vision, triple vision, neck and back injuries and injury to right knee. Plaintiff claimed she was unable to work and sought economic damages in excess of $200,000. Jury awarded damages of $24,325. Plaintiff’s lowest demand was $47,000. Mr. Giometti defended motorist in bodily injury action arising out of low speed rear-end collision. Plaintiff claimed damages for cervical strain and TMJ. Jury awarded damages of $10,500. Mr. Giometti defended motorist in bodily injury action arising out of low to moderate speed rear-end collision. Plaintiff allegedly suffered injuries to head, neck, knee and left shoulder, including torn rotator cuff. Jury ruled in favor of defendant, finding plaintiff failed to satisfy the PIP threshold. Mr. Giometti defended minor driver and her mother in bodily injury action arising out of motor vehicle accident. Plaintiff alleged defendant driver was negligent for making left turn after dark without headlights. Jury found that defendant driver was not negligent. Mr. Giometti defended driver whose vehicle rear-ended plaintiff’s car. Plaintiff claimed neck injuries resulting in disk herniation and cervical fusion. Plaintiff’s husband claimed loss of consortium. Jury rendered verdict in favor of defendant. Corazon Loza v. State Farm Mut. Auto. Ins. Co. Plaintiff filed action against insurer for breach of contract, willful and wanton denial of PIP benefits and bad faith. Plaintiff claimed PIP benefits for TMJ. Mr. Giometti defended insurer, which denied 70% of all bills based upon apportionment by IME dentist, who related plaintiff’s need for treatment to pre-existing bruxism. Plaintiff sought summary judgment on ground that because she had no reported symptoms before accident, there was no legal basis for apportionment. Court granted summary judgment in favor of plaintiff and jury awarded plaintiff $6,423.90 for unpaid benefits, treble damages and damages for bad faith in the amount of $28,500. Mr. Giometti defended motorist in bodily injury action arising out of auto-pedestrian accident. Trial was on liability only. Jury found that defendant was 85% at fault for accident and plaintiff was 15% at fault. Sherry Delaney v. State Farm Mut. Auto. Ins. Co.
Mr. Giometti defended insurer in action for breach of contract, willful and wanton denial of PIP benefits, bad faith and punitive damages. Plaintiff sought payment of medical and psychiatric bills following an auto-pedestrian accident. Jury awarded plaintiff unpaid bills of $6,012.93 and damages for bad faith in the amount of $7,000. Jury found in favor of defendant on claims of willful and wanton conduct and punitive damages. Plaintiff’s lowest demand before trial was $50,000. Yolanda Martinez v. State Farm Mut. Auto. Ins. Co.
Mr. Giometti defended insurer in action for breach of contract, willful and wanton breach of contract, bad faith and punitive damages arising out of denial of PIP benefits. Plaintiff’s lowest settlement demand was $190,000. Jury awarded $1.00 in actual damages and $1.00 for willful and wanton denial of benefits; $940.24 for unpaid wage loss benefits; $5,000 for bad faith and $5,000 in punitive damages. Mr. Giometti defended driver whose vehicle pulled out of driveway and collided with plaintiff’s car. Plaintiff claimed she suffered a brain injury, neck and back injuries and headaches. She also alleged TMJ and right knee injuries. Jury awarded plaintiff damages of $5,000. Defendant made a statutory offer of settlement of $7,500 before trial. Janet Ingvaldsen v. State Farm Mut. Auto. Ins. Co.
Mr. Giometti defended insurer in action for breach of contract, willful and wanton failure to pay PIP benefits and bad faith. Plaintiff claimed brain injury, neck and back pain, TMJ, vision problems and psychological symptoms due to accident. Jury found in favor of defendant on all claims. David Lucarelli v. State Farm Mut. Auto. Ins. Co.
Mr. Giometti defended insurer in action for breach of contract, willful and wanton failure to pay PIP benefits and bad faith. Plaintiff claimed benefits for brain injury and severe psychiatric problems following motor vehicle accident. Jury awarded damages of $24,198.39 for breach of contract, but ruled in favor of defendant on plaintiff’s claims for willful and wanton breach of contract and bad faith. Donna Peiffer v. State Farm Mut. Auto. Ins. Co.
Mr. Giometti defended insurer in action for breach of contract, willful and wanton failure to pay PIP benefits, bad faith and punitive damages. Trial court excluded four of defendant’s expert witnesses. Jury awarded plaintiff damages of $10,068 for breach of contract and $10,000 for bad faith, and ruled in favor of defendant on plaintiff’s claims for willful and wanton conduct and punitive damages. Note: The Colorado Court of Appeals reversed the judgment, ruling the trial court erred in excluding the defendant’s expert witnesses. Genelle Austin v. State Farm Mut. Auto. Ins. Co.
Mr. Giometti defended insurer in action to recover unpaid PIP benefits and willful and wanton breach of contract. Jury awarded plaintiff $2,206 for unpaid PIP benefits and ruled in favor of defendant on plaintiff’s willful and wanton conduct claim. Linda Hansen v. State Farm Mut. Auto. Ins. Co.
Mr. Giometti defended insurer against claims for breach of contract and bad faith for failure to pay PIP benefits. Plaintiff’s claims arose from two auto accidents. Plaintiff claimed brain injury, psychological injuries, and muscular and skeletal injuries. Insurer requested plaintiff to attend IME with orthopedic surgeon to apportion injuries and determine whether treatment was related to accidents. Plaintiff refused to attend unless a nurse-observer also attended. IME doctor refused to permit observer, and insurer suspended payment of benefits after insured refused to attend IME without observer. Jury awarded PIP benefits of $28,207, treble damages of $84,621, and damages for bad faith in the amount of $300,000. On appeal, the Colorado Court of Appeals reversed the judgment, but the supreme court later reinstated it. Kevin Mekelburg and Barbara Mekelburg v. State Farm Mut. Auto. Ins. Co.
Mr. Giometti defended insurer against claims for failure to pay PIP benefits and failure to offer insured opportunity to purchase enhanced PIP benefits. Jury awarded plaintiff PIP benefits but ruled in favor of insurer on insured’s claim that insurer failed to offer enhanced PIP benefits. Maria Prabhahar v. State Farm Mut. Auto. Ins. Co.
Mr. Giometti defended insurer against claims for unpaid PIP benefits and willful and wanton breach of contract. Jury awarded plaintiff $11,860 for unpaid PIP benefits but ruled in favor of defendant on plaintiff’s claim for willful and wanton breach of contract. Philip J. Wathier v. State Farm Mut. Auto. Ins. Co.
Mr. Giometti defended insurer against claims for breach of contract, bad faith, outrageous conduct and punitive damages arising out of failure to pay PIP benefits. The jury awarded compensatory damages of $2,866.40 and $0 for punitive damages. The plaintiff’s lowest settlement demand was $75,000. The court directed a verdict in favor of the defendant on the outrageous conduct claim. Mr. Giometti defended a driver in a bodily injury action arising out of a rear-end collision. The plaintiff claimed soft tissue injuries and headaches. The jury returned a verdict in favor of the defendant. Mr. Giometti defended one of two motorists sued for bodily injury arising out of multi-vehicle collision on I-25. Plaintiff alleged neck and back injuries resulting in two neck operations. The court directed a verdict in favor of the co-defendant, and the jury returned a verdict in favor of the driver defended by Mr. Giometti. Mr. Giometti defended a homeowner sued for property damage and negligent infliction of emotional distress arising out of a fire that destroyed the house he was renting to the plaintiffs. The plaintiffs alleged the fire was caused by defective heat tape on a pipe in an older part of the house. They alleged that the defendant failed to get an electrical inspection when he built an addition to the house in 1982 and that if he had gotten an inspection, the inspector would have found the defective heat tape. The defendant alleged the plaintiffs were comparatively negligent because they smelled smoke at 3:30 a.m. but did not call the fire department until 6:30 a.m. The jury found in favor of the defendant. Merlyn L. Ahrens v. Michael D. Parks and Elton Parks, Jr.
Mr. Giometti defended minor driver and his father in an action arising out of rear-end collision. The plaintiff alleged low back injuries resulting in permanent disability and loss of income of $400,000. Plaintiff’s lowest settlement demand was $300,000 and defendant made an offer of settlement of $20,000. The jury awarded the plaintiff damages of $200.00. Mr. Giometti defended motorist in action arising out of a rear-end collision. Defendant admitted liability. Plaintiff alleged whiplash injuries. The jury awarded plaintiff damages of $9,500. Before trial, the defendant made a statutory offer of settlement of $12,500. Mr. Giometti was co-counsel for plaintiff in action to recover damages for breach of warranty and fraud arising out of sale of two used jet engines to plaintiff. The jury returned a verdict in favor of the defendant. Mr. Giometti defended driver involved in multi-vehicle accident on I-25. The jury deadlocked on the issue whether the defendant was negligent. Mistrial was declared as a result of hung jury. Mr. Giometti represented the plaintiffs, an elderly couple, who brought an action against their grand-daughter to recover property conveyed to grand-daughter with a quit claim deed. Plaintiffs alleged that the deed was void ab initio because grandparents lacked capacity and deed was procured through undue influence. Trial court ruled in favor of plaintiffs and held deed was void ab initio. Mr. Giometti represented minor who was defendant in action arising out of motor vehicle accident in which car driven by minor struck a tree. Plaintiff, who was passenger in back seat, suffered severe lumbar injury, which resulted in multi-level fusion. Defendant attempted to settle case for policy limits but was unable to do so. Trial resulted in verdict for plaintiff. Mr. Giometti represented Grange, whichg brought a declaratory judgment action seeking a declaration that an automobile policy issued to its insured, Heidi Schaff, was void because the insured had concealed that an auto that was added to the policy was not owned by her, but was actually owned by her boyfriend, who had no driver’s license because of a DUI. Schaff’s boyfriend was severely injured when he fell out his car while Schaff was driving and she backed over him. Before the accident, Schaff and her boyfriend had been drinking at a bar. Schaff’s boyfriend sought PIP benefits under the policy. In response, Grange filed its DJA against Schaff and the boyfriend, and the boyfriend counterclaimed for breach of contract and bad faith. The jury found for the boyfriend and against Grange on the DJA. In addition, the jury found in favor of the boyfriend on his counterclaims and awarded $175,000 in actual damages for breach of contract; $25,000 in non-economic damages for bad faith breach of contract; and punitive damages of $750,000, which were reduced by the Court to $125,000. Mr. Giometti defended a driver who was involved in accident with plaintiff on U.S. 285 south of Poncha Springs. Plaintiff claimed severe injuries as a result of the accident. Trial resulted in a verdict of $4,000, which was less than defendant’s offer of settlement. Defendant was awarded costs, resulting in a net judgment for $6,954.25 in favor of Defendant. Mr. Giometti defended driver, Mark Putney, who was involved in minor parking lot accident with plaintiff, who alleged severe and permanent neck injuries. Trial court excluded defendant’s accident reconstruction and bio-mechanical experts from testifying. Trial resulted in verdict in favor of plaintiff, and case settled during pendency of appeal. The jury awarded damages of $122,550.00 against Mr. Putney and damages against the co-defendants in the amounts of $50,650.00 and $22,100.00. Lee v. State Farm Mut. Auto Ins. Co.
Mr. Giometti was co-counsel in defending insurer in action for breach of contract and bad faith arising out of denial of PIP benefits. Jury could not reach a unanimous verdict, and a mistrial was declared.